P.S. I'm sending handmade cross-stitch buttons to everyone who donates to our Alzheimer's walk in October! Details here. Back in March, I had the pleasure of participating in a weekend upholstery class at Spruce, a local upholstery studio (something I've wanted to do for ages!). For the class, I brought in a super comfy side chair that had been given to me by my parents-in-law. 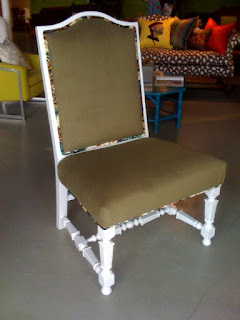 Over the course of the two-day workshop, I stripped the chair, painted its wood white, rebuilt its cushioning, and reupholstered it using a combination of vintage floral fabric from Thread-Bare and new solid olive green (a color which is ridiculously difficult to capture on film!) upholstery fabric. The welt cord outlining the chair's edges is made from the floral fabric, which contains shades of cream, teal, brown, and sage green. The project was pretty physically demanding (I had sore shoulders and hands for a few days after), but totally worth it. I especially love how the back of the chair frames the vintage floral fabric. From unfinished wood, to painted wood. These boxes will go on our bathroom shelves and be used for storage. I'm going to start posting some of the projects I've been working on in the past few months. Tonight I'll start off with a desk I purchased a few months ago. I'd been looking for a desk for awhile, but hadn't had much luck finding anything that was the right size and price, or made from something besides reinforced cardboard. So I was pretty excited to find what I wanted during an afternoon visit to Goodwill. The desk is made from sturdy wood, and has lots of internal storage. The price? A very nice $25. Overall I'm pretty happy with how it turned out, thought the paint is still a bit sticky, which makes worry I didn't give it enough time to dry in between coats (or it could be an effect of this darn Texas weather...).